The Sea Breeze Wind Bell will bring back fond memories of the radiant blue seas, calming waves and distant floating gulls. This bell has: 14" bell and the overall length can vary according to wind sail choice. This bell offers a triple tone melody and is Hammertone Blue. Please choose your windcatcher below. Please choose your bells windcatcher from the pull down selection list below. Click Here for pictures of available windcatchers. 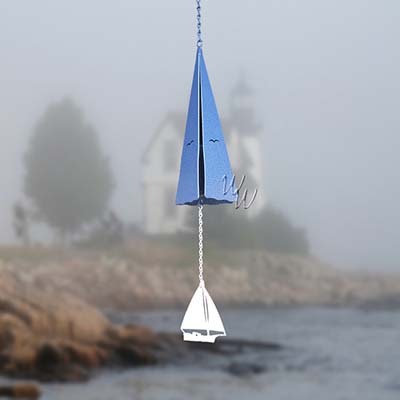 The Sea Breeze™ Wind Bell will bring back fond memories of the radiant blue seas, calming waves and distant floating gulls. The Sea Breeze™ slender elegant features will sure to please any eye. Every North Country Wind Bell is shaped from a high grade steel known as Cor-Ten. This makes them ideal to hang outdoors year-round, and will not twist, tangle or break. As they weather, the steel turns a rich rust color. This natural oxidation doesn't signal a deterioration of the bell, since Cor-Ten will never flake, peel or rust out. Instead, it tempers with age, creating clearer, more resonant tones. This patina both preserves and improves a bells tones over the years. North Contry Wind Bells are durably constructed, individually hand-crafted and hand-tuned in the USA.